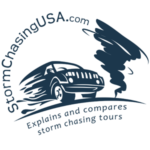 Thank you for checking out Tornadic Expeditions Storm Chasing Tours here on Storm Chasing USA! At Tornadic Expeditions we provide unmatched customer service and accommodations to our guests. We offer 10, 7 and 6-day tours and on-call single day tours. Our storm chasing vacations are limited to 4 seats on most tours and 8 seats (4 seats per van) on select tours. This allows for a FUN, private, personal and comfortable chase experience. The tour van is state of the art with two sources of mobile wifi, power to charge your electronics and a rear monitor to display radar and GPS location. The monitor is also used for entertainment during long drives. Window seats to the action for everyone! We also keep a Yeti cooler with bottled water and snacks! We spend quality time with our guests. You will never be left in the dark! Updates are provided throughout the day during each chase and we'll educate on forecasting, storm anatomy, chase strategy, radar interpretation and much more! You can never ask us too many questions! Experienced. Meteorology and forecasting is our passion. Producing quality forecast for each chase day is of extreme importance. We have the knowledge to get you in areas of tornado potential each day mother nature offers it. Our video has been featured on every national news outlet in the US and many TV programs. Our 2018 tours were amazing with tornadoes and supercells observed from near the Mexico border to nearly Canada! We are reviewed and highly recommended by Storm Chasing USA. Please check out our reviews below from our guests! Thank you for taking the time to get to know us. Please visit our website and contact us if you have any questions or to book your next storm chasing adventure. It's Time to Chase Your Dreams! Experienced, Fun and Personal - Tornadic Expeditions Storm Chasing Tours. Size does matter. We like to be different. Our niche is small, high-quality tours. This maximizes your experience, allows for more flexibility and easier to make last minute changes to logistics when needed to adapt to the ever-changing atmospheric conditions. Passion. We want to see supercells and tornadoes more than you, the guest. Storm Chasing is what we live for and sharing those moments with you is our pleasure and honor. Fun. Everyone loves to have fun! Constant laughs, entertainment, and humor are commonplace in and out of the tour van. Come see and experience the difference of Tornadic Expeditions! Experience. Over 60 years of storm chasing experiences resides within the Tornadic Expeditions crew. Meteorology and forecasting is our passion, being in the right place is our talent. Our tour van is packed with the latest storm chasing technology! Rear facing monitor for our guest showing current radar and live GPS position. This same system is used during down time to play movies and for other entertainment. Each guest gets their own window seat and all seats recline for added comfort! Wifi is included in the van and we use AT&T and Verizon to maintain constant coverage no matter where we are at. Power towers situated in two areas of the van to power and charge your electronics, including USB chargers built in. We keep a small cooler in the rear of the van for extra beverages and snacks to take on the road. If you have been on a tour with Tornadic Expeditions, please write a review. Well.. this was my second year chasing with Tornadic Expeditions and it was by far the best one yet! We got some amazing storms and also some incredible tornadoes! I went from having seen no tornadoes to seeing 10 in 3 days.. absolutely incredible and it's all thanks to Tornadic Expeditions for making my dreams come true. Excellent communication from Erik all the way through until the tour.. excellent service. We were all well informed about the day to day plans and where we were going. We did some long hours in the van but it was very comfortable and we were well entertained. Looking forward to doing 2 tours next year! Erik and Aaron were awesome guides! No shortage of entertainment at all times and they forecasted well and got us on the best storms of the day! This tour was phenomenal. With only 4 guests and two experts up front, it was perfect. Eric and Adam were very knowledgeable and were always "on the chase" checking their radar constantly to keep us in line for any storm developing. Although we did not see a tornado, we still got to experience some fantastic storms. The guys were great! Very easy going, but professional and knowledgeable. Every little thing was handled so well. Always in a good mood and positive energy flowed abundantly. We went from 6 strangers to friends in one day. The van is very comfortable and roomy. Sometimes spending over 10 hrs driving in one day, but we had so much fun, laughing and eating great food. I will definitely use them again in the future for another tour. The van is very comfortable, he even has wifi. There are two computer screens so people in the back can see the radar and follow along with the chase plan. I went on tour 4 for 10 days. During that time I saw 10 tornadoes & covered 9 states from New Mexico to South Dakota & Montana. Erik the tour director would drive miles on end to get us to the best storm of the day, even if the outlook didn't appear severe. He trusted his gut alongside his knowledge and experience and we got to see supercells, lightning shows, amazing sunsets & TORNADOES!!! This was the best experience of my life. The van had 3 other guests, Erik and a guide. It was a comfortable ride with a window view every day. The fun we had was indescribable & I have made lifelong friends. We were that impressed by the tour that we have all booked again for 2019. We stayed in great accommodation and ate at great places. The entire experience is one I will never forget. It was so good that I cancelled my flight & stayed for tour 6 also. The tour was comfortable. I was met prior to the tour commencing and picked up by Erik himself. Erik & his guides were very professional, knew what they were talking about and made it a tonne of fun. We were never put into situations that were dangerous and when we had to relocate at any stage, they were efficient and prompt in doing so. During severe weather, there was never any issues and Erik's driving was amazing. After the tour ended we had a celebration dinner and the process of arriving and leaving was very smooth. Erik was outstanding. On days that were marginal, he made every effort to chase what was the best storm of the day. We got beautiful structures & that alone was impressive. He made an effort every day we were on tour. He would study the weather and study again in the morning. He was always analysing every part of it and trusting his judgement and experience and it paid off. To describe this tour in one word: awesome! Erik Burns is a pro, with an excellent set of skills to examine, evaluate and act on models, weather patterns and topographical boundries. Although the week did not look very promising, he managed to get the maximum out of it and definitely exceeded my expectations: 4 chasing days with triple-tornado warned super cells and eventually one tornado. Of course we want to see the twisters but more importantly you want to understand the dynamics that are going on which he gladly explains! Nice hotels, great company and fully equipped car with wifi and screen in the back so you can track what is going on! Incredible experience that I will never forget. Erik and Adam put us on the storm's that delivered the most amazing structures and lightning and even though we didn't see a tornado this time, they certainly showed us storms that didn't disappoint!. They definately have the knowledge and the instinct to get us on the right storms. Had a great time with the small group which by the end felt like family and I have made friends for life.The tour was very professional and was made welcome from before the tour even started due to the great communication by Erik.I didn't mind the long hours in the car at all, Erik and Adam made us laugh and have fun. Looking forward to coming back for another tour! The van was comfortable to travel in, plenty of leg room. Well set up to be able to enter and exit quickly and safely. Enjoyed watching the screen in the back to follow what they were discussing about the storm's. Great being able to control the temperature in the back by ourselves. Each of us were met at the airport upon our arrival and taken to our hotel by the Tornadic Expeditions before we started our tour the following morning. Both Erik Burns, the tour owner, and Adam Cuker, his co-director, were extremely professional and knowledgeable about storm formations and the best conditions for a tornado to occur. Because we were a small group, only 4 guests and 2 directors, we could easily change our plans to accommodate the weather, be flexible in eating arrangements, and book rooms at the last minute for the small group. I would definitely travel with Tornadic Expeditions again. Our two tour director, Erik Burns, and his co-director, Adam Cuker, were knowledgeable about the storms and constantly analyzed the data to determine the best location for us to be for the near and long term to see a severe thunderstorm and hopefully a tornado. Unfortunately, we did not see any tornadoes, but we we saw many supercell thunderstorms including a 3.5 hour continuous lightning show. There were 2 days of no storm activity in The Plains, so Erik Burns took us to many interesting spots to sightsee instead, including a national park and a national monument. As a result, every day was full of adventures. We traveled in a small van which was kept clean and had a mirrored screen pointed towards the passengers so we could see everything the tour directors were looking at on their laptop trying to analyze the data in real time for the best position to chase storms. This allowed us to ask them many questions on what they were seeing and what it meant. The van also had wifi so each of us could connect a device to access the internet and enough power outlets to recharge our internet devices and cameras, too. There were 4 passengers travelling with Erik and Adam, the two tornado chasing experts taking us storm chasing. We each had a window seat and room to keep our personal day stuff with us. Professional, passionate and personable are three words that sum up Erik Burn ‘s Tornadic Expeditions tours. I signed up for Tour 2, 2017 which unfortunately was a week without tornadoes. Erik did his best in the first few days of the tour to find a weather system that could produce the storm but sadly, Mother Nature was not in the mood to show her might then or for the rest of the week. Erik successfully plied his meteorological skills in determining a strategic route in which to intercept a tornado but the best we were able to do is chase a storm through eastern Texas which eventually came up short. Although the week was a “bust” when it came to tornadic weather, Erik did his best to entertain us, spending two days in beautiful Galveston Beach where we saw some terrific sites, (i.e. alligators and a very unique waterbird rookery), the National Weather Center in Norman OK and the Twister Museum. Erik has a very pleasant personality and sense of humor and bends over backwards to make sure his guests are having the best time possible. Guests should be aware that there’s a lot of time riding in the van which can be quite boring if you’re not chasing a storm. Nonetheless, the van was comfortable and Erik played videos during the long drives. Many times we checked into our hotels very late. This may have been different if the week had been stormier. I highly recommend Tornadic Expeditions and will try again, with them, to see a tornado! I was chasing with Tornadic Expeditions and Erik Burns as one of their first guests ever. We were treated with one of the best weather setups in ages with notably the Dodge City tornado outbreak (which we saw) and the 90 minute Chapman tornado (that we missed) during our week. All in all we some something between 15-20 tornadoes, which is absolutely incredible! The tour itself was in most aspects great. We started each morning by going through the forecast so we would understand what would happen during the chase. During the chase and at each stop Erik would explain what was happening and answer every question with good and elaborate answers, which was highly educational. The tour was an emotional rollercoaster starting off with seeing tornadoes three days out of four, including the amazing Dodge City-tornadoes. We unfortunately missed on the Chapman tornado just like many others, but it still was a huge bummer. Then we experienced the "perfect setup" on our last day that turned to a state wide-bust. Erik still managed to find a supercell in OK where we were some of the first ones to be on. All in all, it was a great tour, especially considering it was the first one for Tornadic Expeditions and I can highly recommend TE for other guests. The 4 out of 5 is a strong 4. Erik Burns did a great job forecasting the storms and "gave" us the chase of a lifetime in terms of the Dodge City tornado outbreak by recognizing the pattern early enough for us to blast up there, despite having another target selected. As with most other tour guides we caught some tornadoes and missed some other days. As a tour guide Erik is very friendly, energetic and involved/emotional. You can tell he really loves tornadoes and will share both ups and downs with you, maybe even to a greater extent than most guests! He is highly dedicated to make the tour guests feel welcome and catered for during the tour. We drove a very comfortable Toyota van that was equipped with a screen for the passengers in the back to be able to watch radar etc, which is a VERY good feature all tour vans should have. There is plenty of leg room and the van has both USB and regular power outlets as well as WiFi, which is very convenient. The only thing that bothered me is that the van has reduced visibility out the front window but Erik told me he would reconsider arrangements for that until next season, based on our feedback.